In a dystopian near future, the world has become a very polluted place at the point that most of women are infertile. The social unrest led to the emergence of a new totalitarian regime, that rose in a territory that used to be part of the United States. 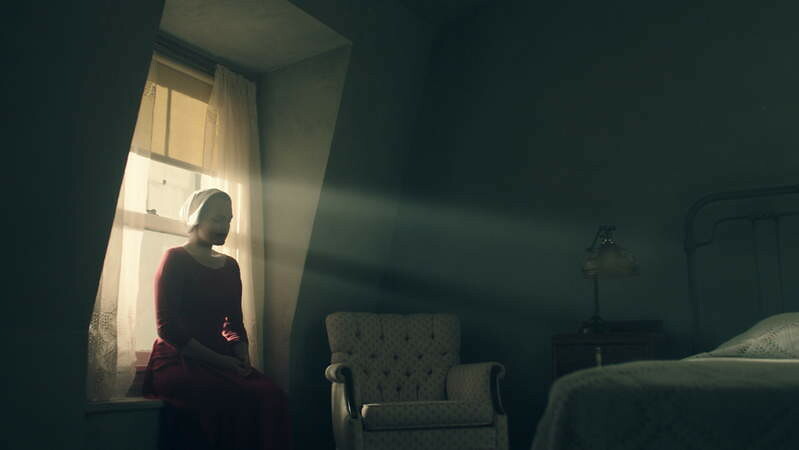 A Christian puritan dictatorship was established and all the remaining fertile women came under the control of the state, to serve wealthy families. 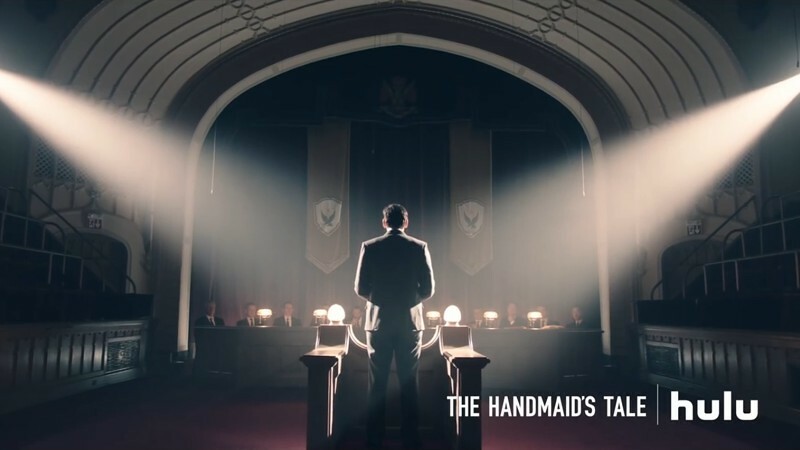 This acclaimed Hulu series are based on the 1985 novel by Margaret Atwood. The cast is headed by Elisabeth Moss (Mad Men) as the Handmaid, and Joseph Fiennes (Shakespeare in Love) as the powerful elite Commander. 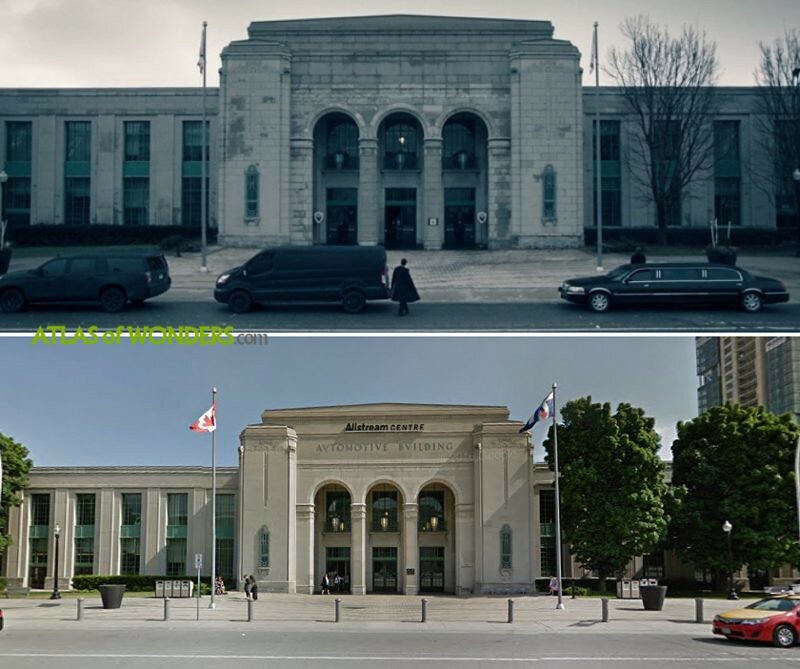 We can recognize many landmarks of Toronto in the series, like the City Hall. In S01E03, June and Moira enter a coffee shop filmed at the junction of Queen St E and Degrassi St. 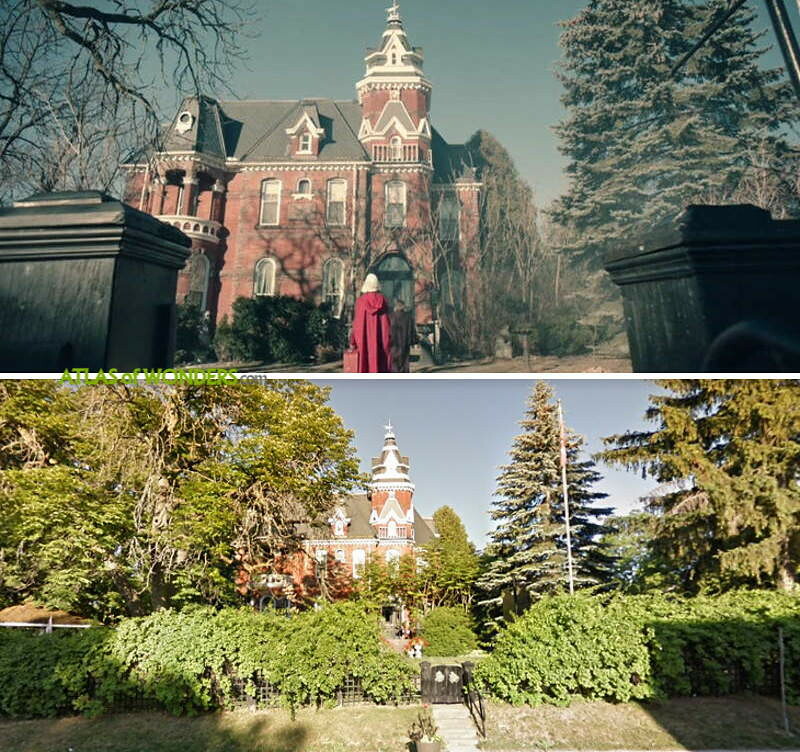 Commander's Putnam mansion from episode S01E09 is a property at 25 Park Lane Circle, Toronto. S01E09: The production was also filming at the Old Mill Bridge over Humber River in Etienne Brule Park. Also in Cambridge, the Mill Race Park is the area next to the river that has been used in several episodes. The scene of the smuggling boat from episode S01E07 was filmed at The Fishway near Hamilton. Also according to one of our readers, the Red Centre is the old King George Public School at 77 Gage Ave N, also in Hamilton. 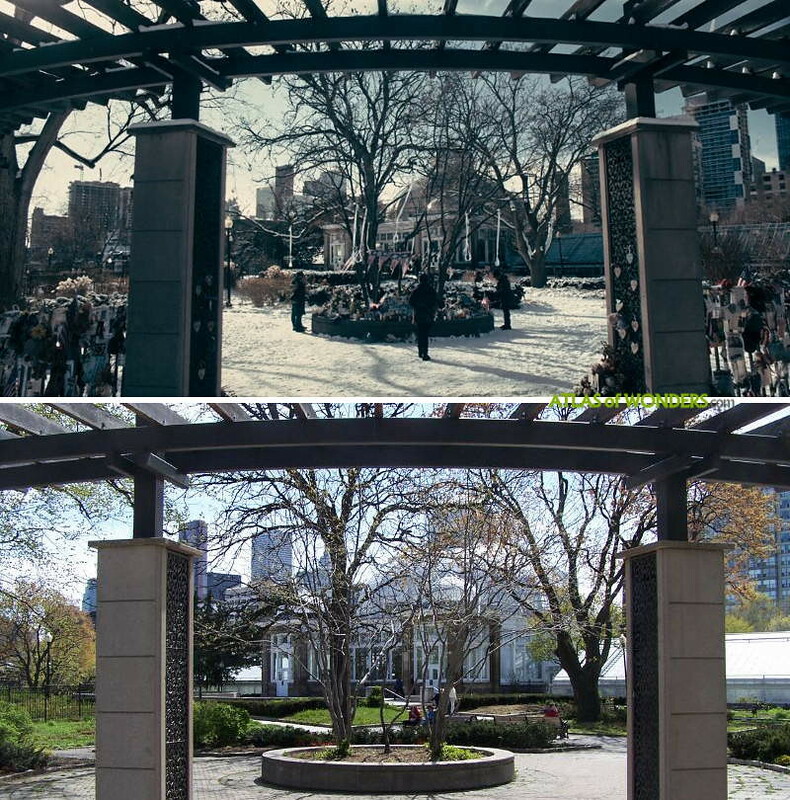 The memorial park that appears in several episodes are the Allan Gardens in Toronto. 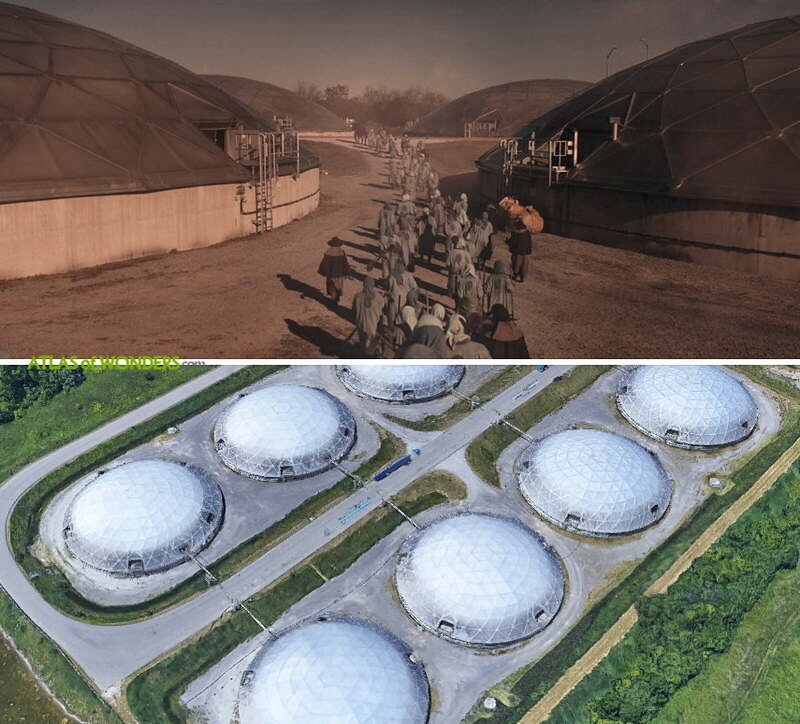 The domes from the colonies are from Halton Biosolids Management Centre, near Oakville. 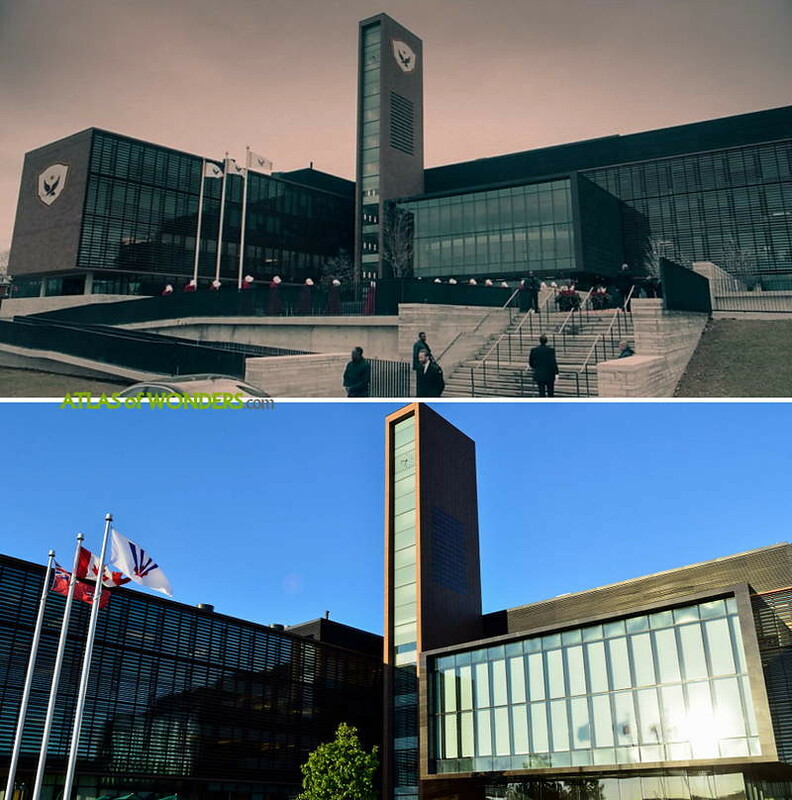 The new Red Center (the Rachel and Leah Center) from S02E06 was shot at Vaughan City Hall. 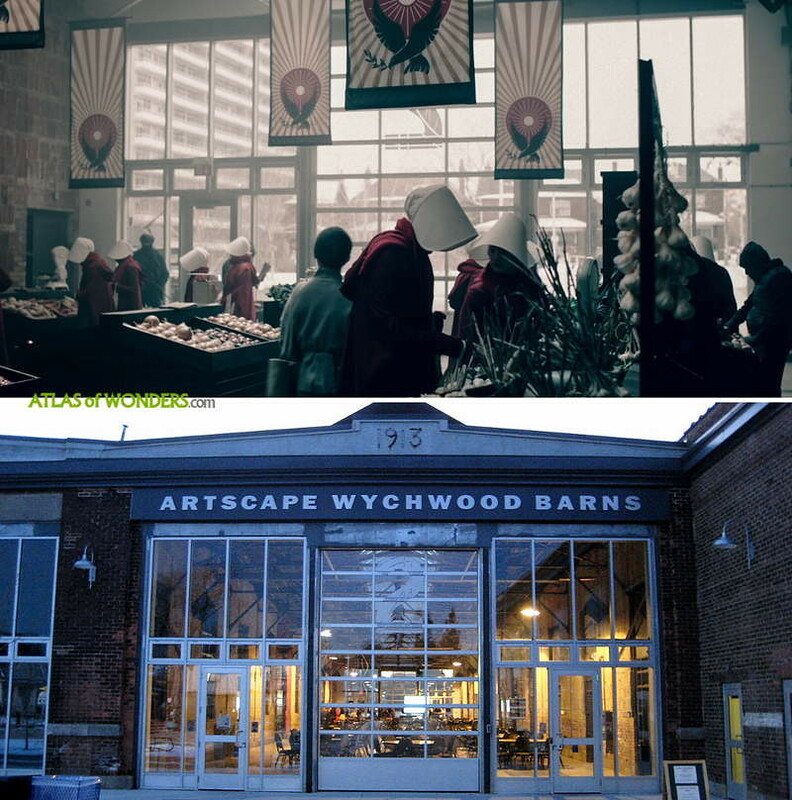 At the end of S02E07 there is a scene with the handmaids filmed at the Artscape Wychwood Barns (Toronto). 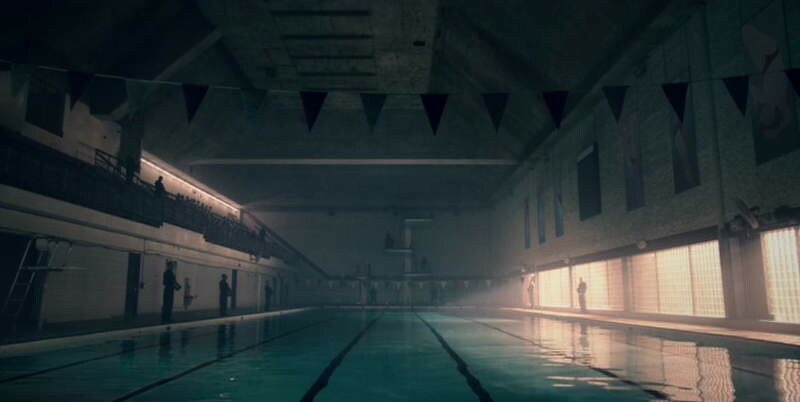 The swimming pool from S02E11 was shot at the McMaster University in Hamilton. 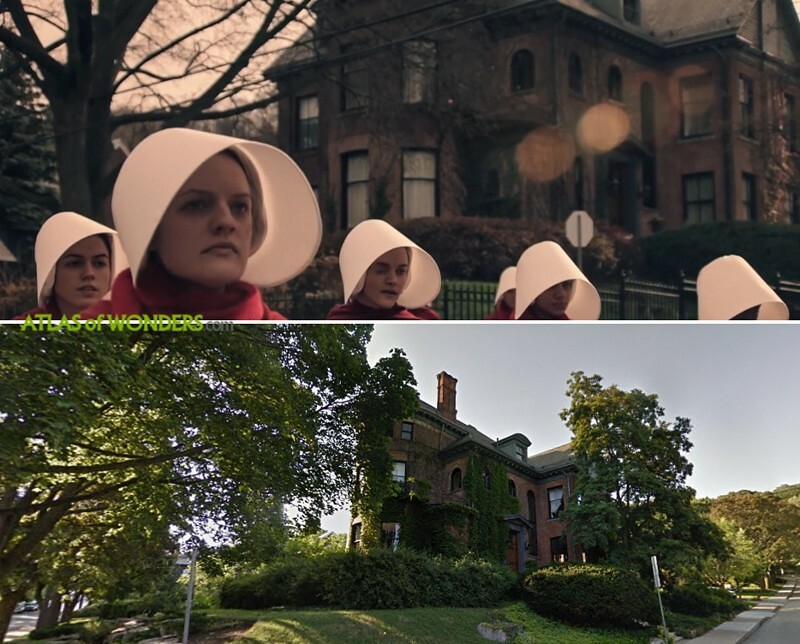 Can you help to improve this post about the filming locations for The Handmaid's Tale? To complete and correct this report, any feedback, info or images that you may have are more than welcome, thank you! The red centre is in the old King George school on gage st in Hamilton. The jogging/coffeeshop scene takes place at Queen & Degrassi. The Commander's house is specifically 105 Aberdeen. 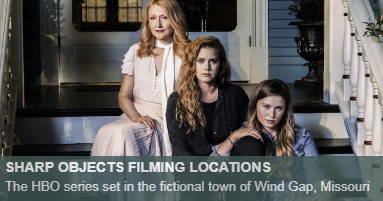 They filmed some scenes on Park Lane Circle in Toronto. That's in the bridle path. Not sure the scene but I work there. The scene in Birth Day when Offred and Ofglen are walking and people stop to grab a man on the street is Jackson St. and James St. South in Hamilton. The church being torn down is St. James on James St. Yes James st baptist not graceworks. The courtroom is actually the City of Cambridge Council Chambers at 50 Dickson Street. 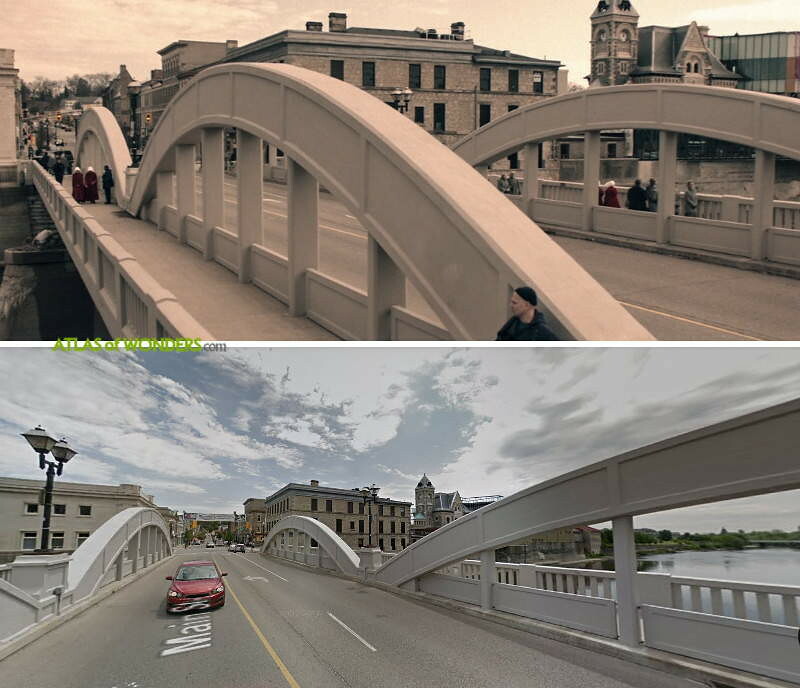 The Main Street Bridge in Cambridge, Ontario is featured when June and Moira and the other protesters are raided by the troops. The coffee shop they flee to is called The Grand Cafe https://www.grandcafe.ca/slideshow . 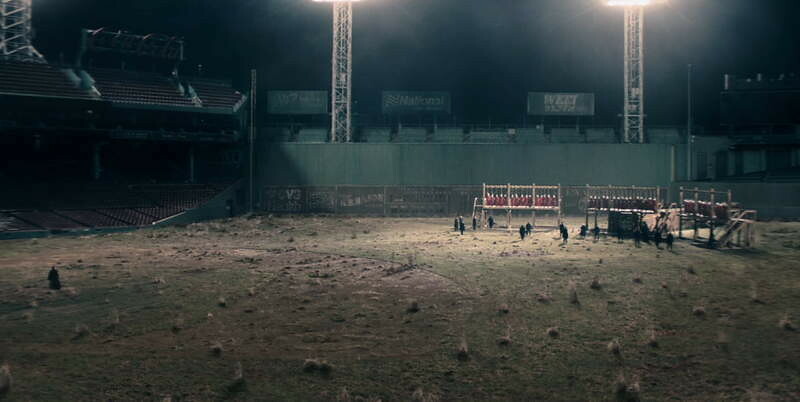 The cinematographer makes Cambridge look so beautiful, in stark contrast to the horror of the political situation. 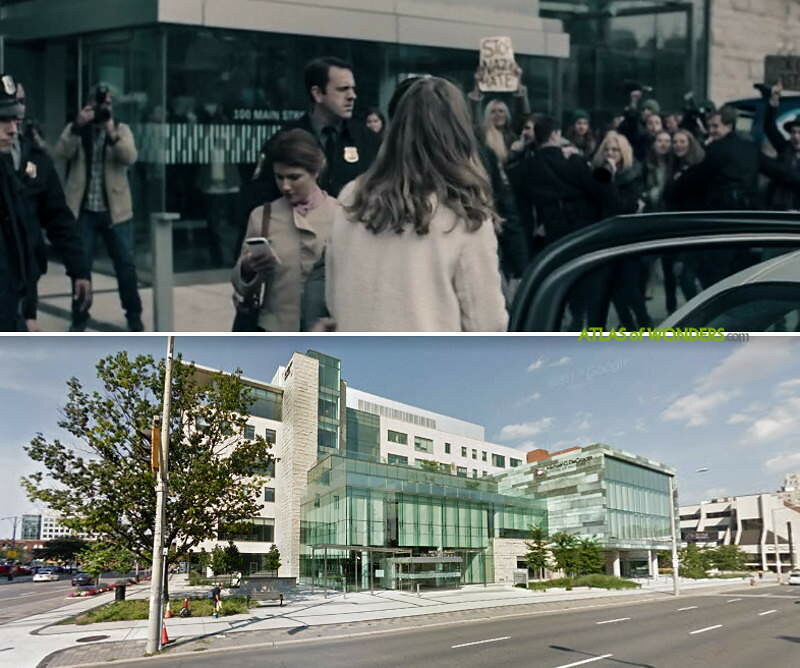 The hospital in the second episode is a combination of Lakeridge Heath in Oshawa (outside) and Bridgepoint Health in Toronto (inside). The inside of the offices from the third episodes at int he Ernst & Young Tower at Bay & Wellington. Thanks for this post! In ep 5, where were June and Luke meeting for coffee? The coffee shop is Dark Horse Espresso Bar at 416 Front Street East. 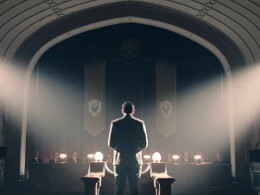 Where is the banquet in episode 6 shot? Is it the king eddy? Where the handmaid's are lined up ready to go inside the banquet is shot at Liuna Station on James Street N in Hamilton. The banquet was at the Fairmont Royal York. Anyone recognize the church, abandoned town, or offices at the end? Where is the wall where they showed the people who were hanged? At the Mill Race Park in Cambridge, near the river. The headquarters of the eyes looks like the Automotive Building at the CNE grounds. The diner is Ted's Restaurant in Scarborough and Jezebels is once again the Royal York. The Putnam house is at 25 Park Lane Circle. The bridge is Old Mill Road Bridge. Beanfield Centre is located at Exhibition Place https://www.explace.on.ca/venues - the CNE is an annual event that happens on the Exhibition Place grounds. The council chamber is the Scottish Rite in Hamilton (the one in the big picture at the top of the page). 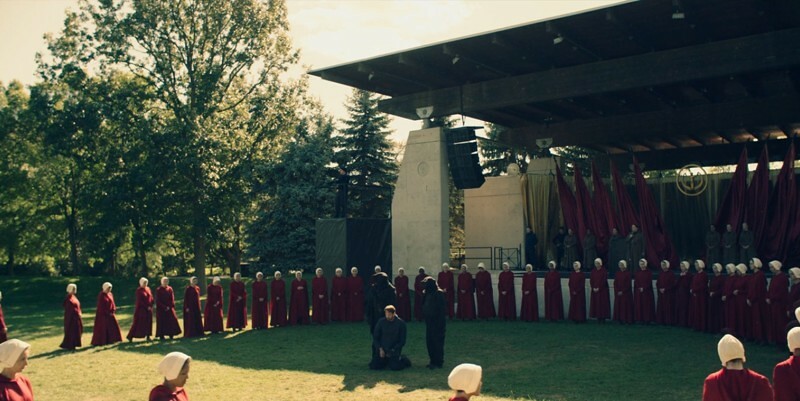 i THOUGHT PART OF THE BANQUET SCENE, BEFORE DINNER, WHERE THE HANDMAIDS ARE LINED UP, and some scenes at the elevator was Senate House in London? But I guess I am not correct. 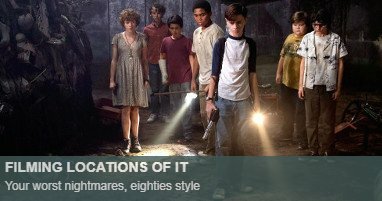 Was everything shot in Canada? In episode 9, when Janine goes to OfDaniel's house, the house is located at 51 Aberdeen in Hamilton. When Luke was escaping in EP 7 the roads and woodland were shot around Crooks Hollow Road in Greensville just outside Dundas. 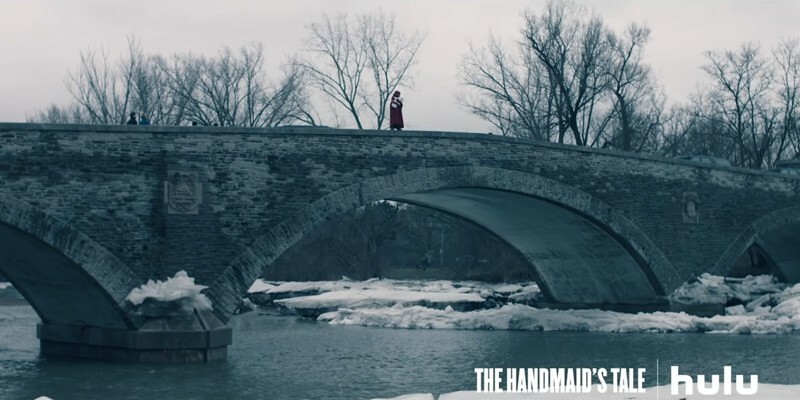 The City of Cambridge developed a really cool map of all the locations used in Handmaid's Tale. 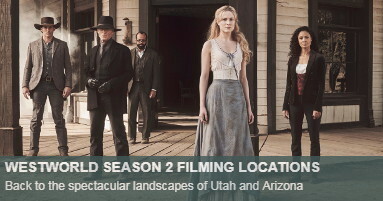 Will be updated with Season 2 locations as they air. The gym in the school where Offred ate in the season 2 episode 1 or 2 looked so familiar. But I need to know where is it filmed. Thanks in advance. the red centre is a church in the beaches in s1. st aidan's. i think it's safe to assume it's the same in s2. The school that Emily taught at was shot in one building, the CCT Building at the University of Toronto Mississauga. 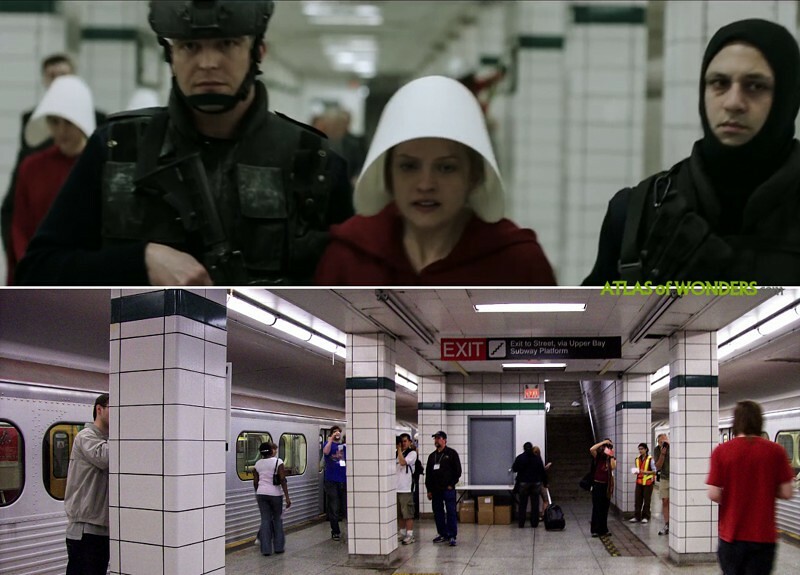 S2:E2 - The scenes where the lesbian couple (can't remember their names) is trying to fly out of Gilead were shot at Terminal 1 of Pearson Airport in Toronto. S2:E3 - The scene early where Moira is running in a snowy park is Allan Gardens, Toronto. (I walked by when they were setting this up and the "little America" flags gave away it was for for Handmaid's Tale). No update? 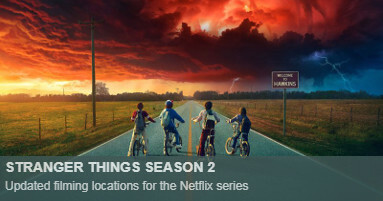 on reflection, I might be wrong about Pearson but S2:E3 was definitely the Allan Gardens Conservatory (when you live three blocks away and see the set with "Little America" flags, nooses hanging from trees, and "missing persons" photos, it's hard to be mistaken). The last image on your site (the new Rachel and Leah Center) from episode 2.06 is Vaughan City Hall in Vaughan (2141 Major MacKenzie Dr W, Maple). I think that final image is the Highland Creek water filtration plant. The greenhouse visited in "Toronto" S2 E9 is the greenhouse at The Royal Botanical Gardens in Burlington, Ontario. No it really isn't. It's Allan Gardens. They look nothing alike. RBG is mainly outdoors and does not have a domed conservatory like Allan does. s2e10: The mansion where June meets Hannah is off of Cruickston Park Ln, near Cambridge ON. (There's not a good view on Google Maps). Thanks a lot, this was a difficult location to find! The mansion where June meets Hannah is called Cruickston Park. It has been the backdrop for a lot of hollywood movies. Such as Cold Creek Manor, RED, Bitten, Hero's Reborn, Murdoch Mysteries, etc. There is a lot of history with this property. Here is a rare look inside and the family that lives there. https://www.cbc.ca/life/video/step-inside-a-restored-elizabethan-manor-with-30-ft-ceilings-and-a-baby-goat-1.4681449 For more history Google Cruickston Park. It is gorgeous! Cheers! 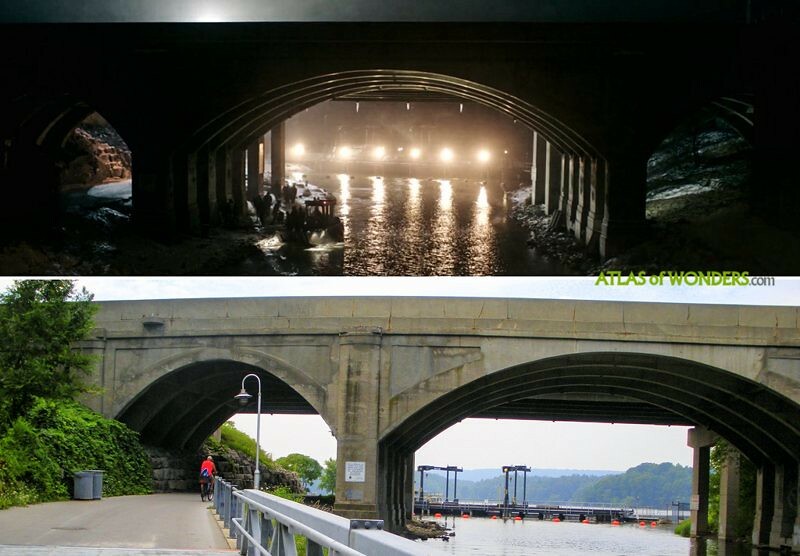 The final scene of the finale is in Burlington, just past Hidden Valley Park, in the tunnel under the 403. The hotel Serena and Fred stay at in Toronto is made up of multiple locations. The lobby bar, where Serena meets Mark Tuello, the CIA agent, is the Ritz-Carlton Toronto's DEQ Lounge. 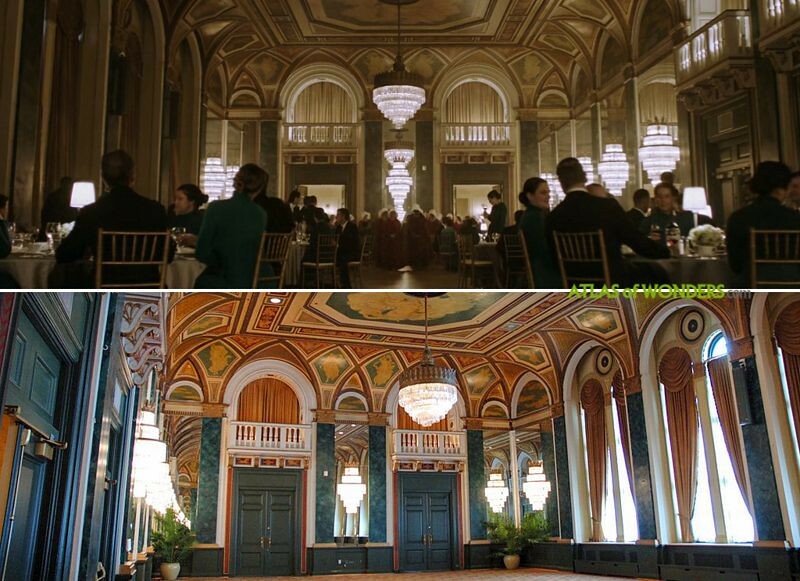 The lobby of the hotel, seen in multiple scenes, is the lobby of the Hotel X Toronto. The exterior entrance driveway, where Luke and the other protestors gather, is the Hilton Toronto, at 145 Richmond St. The "Hilton" signage is all covered with prop signs for the fictional "Broderick Hotel." 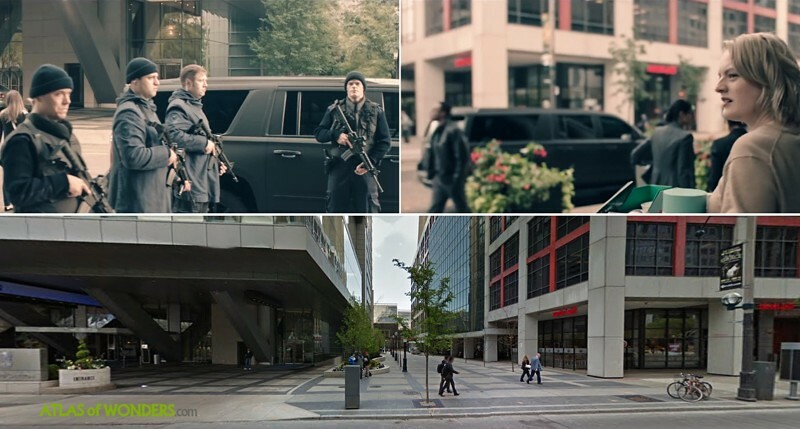 Interestingly, the Hilton is also easily visible in the establishing shot of Toronto, as Serena and Fred's limo drives up University Avenue, and the huge "Hilton" name on top is clearly visible in the shot. almost certain the room Fred & Serena stay in is at the Ritz as well. 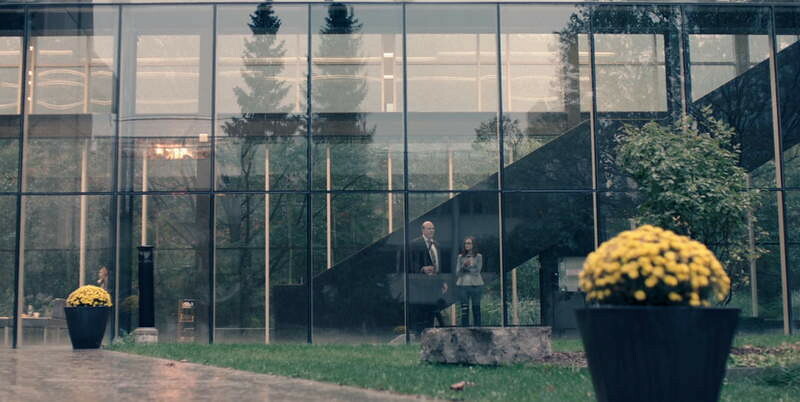 The greenhouse that Serena visits in Toronto in S2 E9 is not The Royal Botanical Gardens in Burlington. There is no domed greenhouse there. It is the Allan Gardens Conservatory in downtown Toronto. The scene when June get on the train while trying to escape to Canada, is filmed on the UP train that operates between the airport and Union Station in Toronto. You can even see the "UP" logo on the head rests.